Diamonds are the only effective way to create intricate shapes, drill holes, reshape your glass or get a good finish on it. Specifically designed diamond drills must be used when drilling holes in glass. We stocked two ranges - standard and sintered diamond drills. Standard diamond drills are perfectly suited to the hobbyist or those who need to drill the occasional hole in glass. The drills have a hollow tip, with diamonds bonded to the edge of the tip and up the sides of the drill. This style results in a hole the size of the tip and a smaller core or plug. Sintered diamond drills have diamonds embedded directly into the metal tip of the bit. As the tip wears down, new diamonds come to the surface. 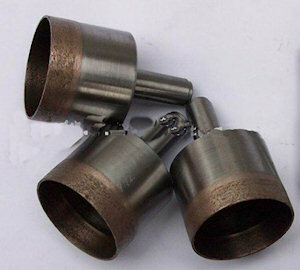 Sintered diamond drills are more expensive than standard diamond drills, because they are heavy duty, drill more slowly, but last longer.